First of all thank you for an amazing 2015. We are so fortunate to have all of you supporting us, so we can support you with the best instruments and keep pushing the bar for new levels of sample-realism. Yet words alone cannot describe our appreciation. How about up to 40% off any 8Dio product, including bundles? We’ve managed to create over 30 products in 2015, including our massive AGE (Acoustic Grand Ensembles), Aura Guitars, Epic 200-Person Lacrimosa Choir, our gorgeous Agitato Sordino and ultra-fast playing Agitato Arpeggio. We also released our beautiful Studio Sopranos, Laurie Haus Solo Vocals, three deep-sampled pianos, including 1990 Studio Piano, 1990 Prepared Piano and our recent 1901 Upright Piano and many, many other products. 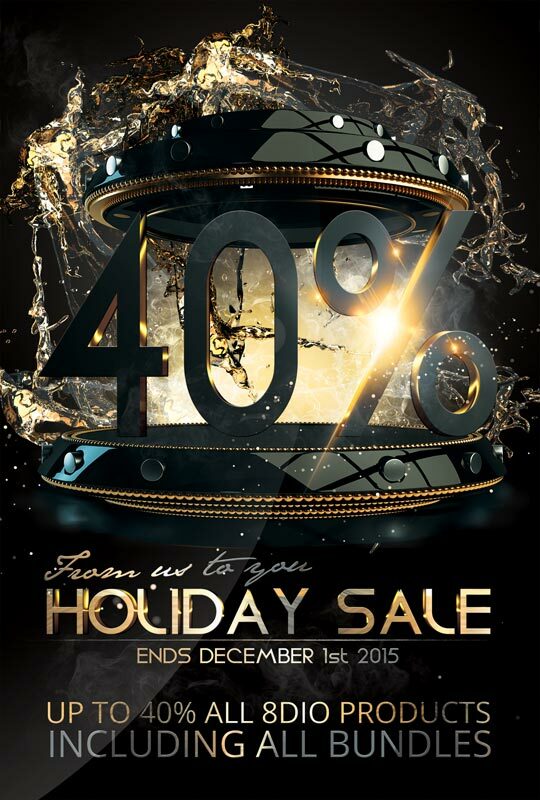 40% Off ANY 8DIO product. (Minimum of $600 in value). 30% Off ANY 8DIO product. (Minimum of $400 in value). 20% Off ANY 8DIO product. (Minimum of $200 in value). 50% Off ANY 8DM product. (Minimum $100 in value). Important: This exclusive offer expires December 1st 2015. The offer can not be applied retroactively against any previous purchases. If you should need any assistance, please do not hesitate to reach out by writing us at support@8dio.com and we will get right back to you. This entry was posted in Free, Pirateria, Plug In, sconti, Vst. Bookmark the permalink.